The die was cast. There were no more questions, no more hesitations. The actions of the Warrior Queen had sealed the fate of the Greek Demos. Xerxes, the Great, would take his army and blacken the soil of Attica with their blood. He swore to his God and to his ancestors that Athens would burn, and he would spit on the sacred ground of the Greek civilization. There was no turning back. The Persians would take their justified vengeance. Dr. Jeffrey Donner, a clinical psychologist with over 30 years of private practice experience, explores the edges of personality disorder as well as ancient mythological power through his fictional writing. Dr. Donner’s monthly newsletter covers many areas of psychology, ranging from typical, psychological issues (e.g. depression, developmental psychology, parenting, and anxiety) to more complex psychological phenomena (e.g. trauma, addiction, multiple personality, etc.). The newsletter explains psychology topics in everyday readable terms. Those readers who purchase the subsequent newsletters will also be able to ask questions related to the newsletter content on the blog associated with Dr. Donner’s web site. Dr. Donner lives in Upstate New York and works extensively with all types of personality disorders and mental health problems. In his private practice, Dr. Donner consults with New York State courts and agencies to evaluate and diagnose individuals. He specializes in personality, neurological and learning disorders. Dr. Donner received his Ph.D. from the University of Ottawa in the early 1980’s. He directed a collaborative Boards of Cooperative Educational Services (BOCES) program treating emotionally disturbed children and adolescents in Upstate New York. Under Dr. Donner’s supervision, the BOCES program won awards for its uniqueness in its partnership with a local psychiatric center. In his Descent of Madness series, Dr. Donner takes his readers on a psychological journey following complex distorted personalities. The first book, “Descent Into Madness”, draws readers into the world of a mysterious pyromaniac seeking to avenge past emotional traumas. “Descent into Madness” is currently in publication and available through Amazon, Kindle and other outlets. The second book in the series, “The Boundaries of Hell”, examines the tortured life of a synesthesiac, a person that can smell emotions, stalked by a methodical psychopath. Dr. Donner continues to work on the untitled third book in the series. With regard to ancient mythological power, Dr. Donner is releasing a series of novels called, “The Great Persian Saga”. The first book in this series, Persia- Pride and Power, takes place in Persia circa, 500 B.C. This novel focuses on the great Persian dictator, Xerxes, and his hatred of the Greeks. Xerxes also confronts a rogue priest named Ningizzida, who haunts him as much as the Greeks. Artemisia, the greatest female warrior of all time, comes to Xerxes defense, as he faces external and internal threats to his sovereignty. Book II of this saga, “Greece”, occurs during the same period as the first book. “Greece” centers on the Greek hero, Themistocles, and the birth of democracy. Themistocles struggles against aristocratic forces within Greek society as well his own hedonistic addictions, to press his egalitarian principals. The book brings a new perspective to Greek myth, spanning the Greek pantheon and examining the Gods’ motives. As Greek society evolves, the Persian hoard awaits on the horizon set to destroy the Greeks and their fledgling democracy. Book III of the saga, “The Great Oracle at Delphi”, takes place at the mythological “center of the world”. As the novel opens, the Greeks and Persians converge on Delphi to seek out the Delphic Oracle for insight into the future regarding the threat of war between them. The Delphic Oracle made prognostations about religion, philosophy, life and death, and history in the ancient world. Although the Delphic Oracle wields significant influence over generations of Kings and entire civilizations, the Delphic Oracle does not seek to interfere in the affairs of men and women. Instead, the Delphic Oracle defers to the Greeks and Persians to interpret the wisdom of the God Apollo to determine their fate. 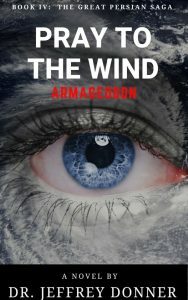 Book IV of the Saga, “Pray to the Wind”, finds the Persians invading the Greek homeland. It is the time of the battle of Thermopylae, as well as the destruction of the Acropolis. In the aftermath of the battle between tyranny and democracy, Dr. Donner explores the emotional toll on Artemisia, Themistocles and Xerxes, their relationships to each other and historical legacies. Dr. Donner has also finished a novel about the Amazon woman of southern Ukraine. This novel, “The Violent Times”, takes readers to 1500 B.C. and focuses on the exploits of Deianeira, an Amazon heroine, who must battle the great Hittite Empire to save her tribe from genocide.